Here in the States we have the (now dying, hallelujah) Too Fast, Too Furious wannabe race crowd with their tiny Honda and Mazda "conversions" into street rods. In Europe, the hot new "supermini" fad is just getting started as would-be "racers" trick out their Mini Coopers and other tiny machines. Enter Renault with this new Clio Renaultsport 200 Turbo special edition of the diminutive Clio hatchback. Far from the underpowered tin boxes that made up the mini class of yesteryear, this little machine has a 1.6-liter turbo gasoline engine putting out a screaming 200 horsepower (at 6,000 RPM) with mid-range torque at 240 Nm starting at only 1,750 RPM. That gives this little yellow street rod a 0-62 mph time of only 6.7 seconds. All at a weight of only 1,204 kilograms - more than 35 kilos lighter than its predecessor. To bring the Clio Renaultsport into the modern racing age, this new version has a six-speed transmission with paddle shifters on the steering wheel and the first use of multi-change down function on a non-supercar. Obviously putting this new Clio in a class of its own. Can you say "mini supercar?" Okay, maybe that's stretching it too far. Still, with all of the hotness added to this supermini, including hydraulic compression stops in the shocks, high-end steering calibration, selectable driving modes including Rally Sport Drive and Race (faster shifting), and Launch Control traction control (in Race mode) for off-the-line grip. For those serious about their hot rodding, an optional Cup chassis is also available, dropping ride height by 3 millimeters and adding 15% more stiffness to the chassis. All Renaultsports will have an RS soundpipe sending engine grumble (as it were) into the cabin. 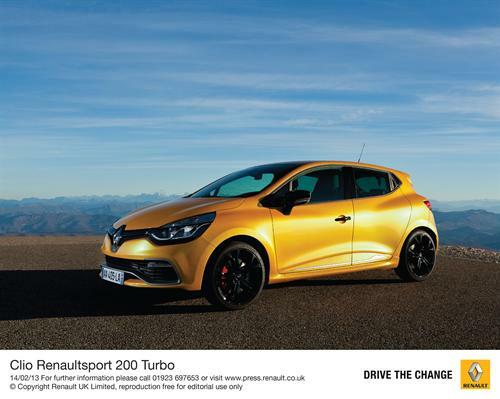 Fuel economy isn't lost in all of this, however, with the new Clio Renaultsport 200 Turbo gaining nearly 25% over its predecessor at 44.8 mpg (combined EU cycle) and with lower carbon emissions. In keeping with its intended market, the new Clio Renaultsport also has every connectivity option you can name and a lot of "Formula 1-inspired" gadgetry. The five body color options include the Liquid Yellow shown here. Pricing will be released at the end of the month with ordering in the United Kingdom beginning on April 1 and delivery beginning in June.